Davinde Savværk A/S is a hardwood sawmill, where the main emphasis is on beechwood, while we also process woods such as cherry, maple, oak and ash. In order to secure the finest in raw materials, we source the lumber ourselves, primarily from Denmark, along with a proportion from abroad. The logs are cut on an ultra-modern block saw. After kiln-drying, the planks are cut into lengths to your specifications and quality requirements. In order to ensure optimum availability at all times, Davinde Savværk keeps approx. 1,200m3 of kiln-dried planks in stock, covering a range of different standard thicknesses and grades. In addition, we keep stocks of approx. 500m3 of kiln-dried sawn lengths/squares of different grades. We welcome orders for more complex products, such as planed, drilled, milled and polished items. 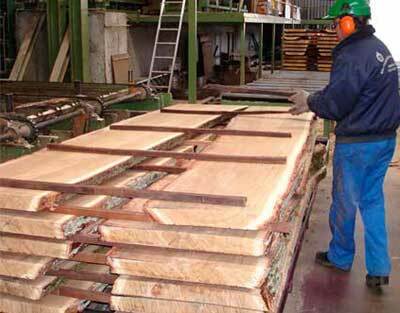 Furthermore, since 1935 we have specialised in steam-bending of solid hardwood. We will strive at all times to meet your particular requirements for custom products in solid wood.